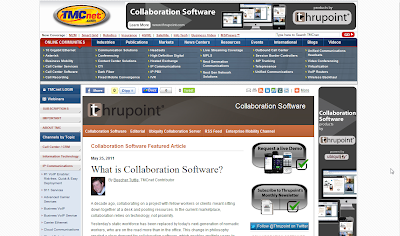 I'm not the only one talking about the benefits of working in a virtual collaboration environment. Beecher Tuttle recently posted an article on TMCnet discussing how companies are using collaborative software to lower operation costs, improve productivity, and increase employee engagement. One thing I pointed out in the comment I left on his article was that using software to collaborate doesn’t have to be through a "a myriad of mediums," as he wrote. Some technologies -- cough, cough, ProtoSphere. Ahem -- can combine these tools into one immersive collaboration environment. Click over to Beecher's article to see what benefits he highlighted and my reactions. While you're there, leave some comments of your own.